The brothers finished 38.7 seconds ahead of Saturday's winners John Holden and Andrew Winkle. 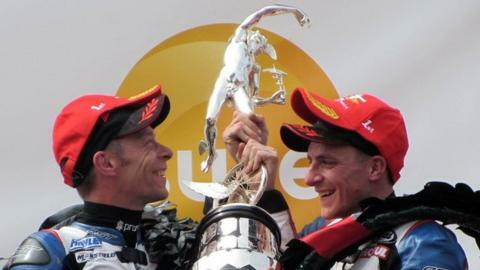 Former world champions Ben and Tom Birchall earned their fourth TT win in the second sidecar race of the week on the Isle of Man. The brothers from Mansfield ended the race 38.7 secs ahead of Saturday's winners John Holden and Andrew Winkle. Tim Reeves and Patrick Farrance were a further 18.4 secs behind in third. The Birchalls dedicated their win to Dwight Beare, who died during Saturday's race after a crash near the course's Rhencullen section. The IEG Racing pair set the fastest lap of the race at 115.696mph on the way to victory. Tom Birchall, 29, said: "This means so much to us. It was a great race and it means a lot to win." Runner-up Holden, of Silicone Engineering/Barnes Racing, said: "We didn't have the speed to catch them, but we are pleased with a first and a second." Seventeen-time winner Dave Molyneux and Dan Sayle led the Birchalls by 3.75 secs after the first lap, but retired at Ballig Bridge on the final lap, ending any hopes of an 18th TT success. Karl Bennett and Lee Cain finished fourth, Matt Dix and Shaun Parker fifth and Steve Ramsden and Matty Ramsden completed the top six. Thirty-three crews completed the 119-mile race which was delayed by mist on the island.